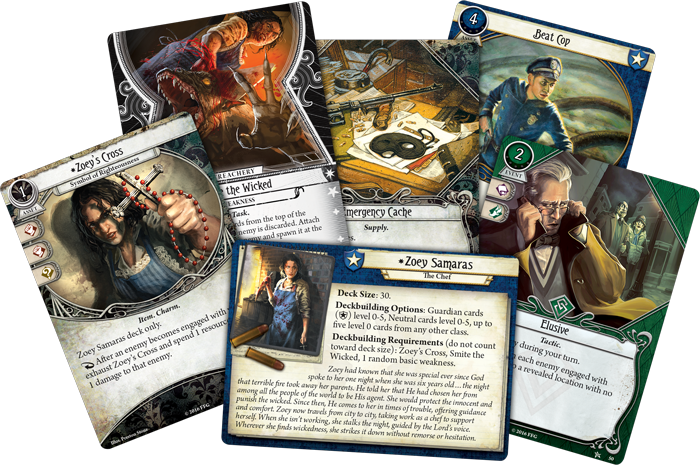 In Arkham Horror: The Card Game, you step into the shoes of Arkham’s bravest investigators, attempting to solve eldritch mysteries and defend their world from the power of the mythos. From the Core Set to The Forgotten Age, new characters have joined the team and they have gained new implements to help them in their battles. But how does one take the tools at their disposal and turn them into an effective deck that can measure up against evil that seems to grow stronger with each passing day? Now, as investigators prepare to take on The Circle Undone, we turn to our guest writers Frank Brinkley and Peter Hopkins for an answer. Frank and Peter are both fans of fantasy, sci-fi and weird fiction, which led them to the rich world of Arkham Horror: The Card Game. They are the hosts of the Drawn to the Flame podcast, which they started in early 2017. 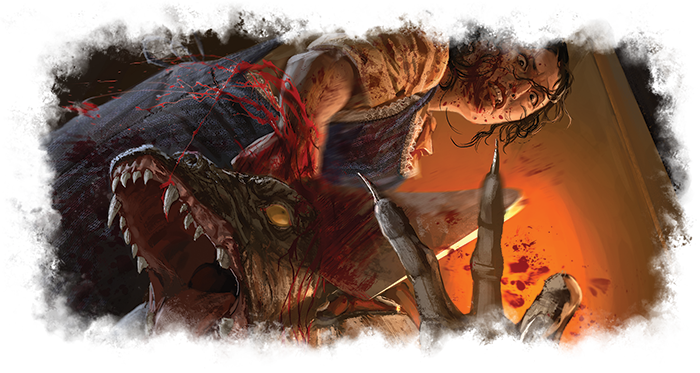 Today, they’ll take a closer look at the art of deckbuilding in Arkham Horror: The Card Game, providing strategies to help you progress from the example decks from the rulebook and become a true master of the madness! 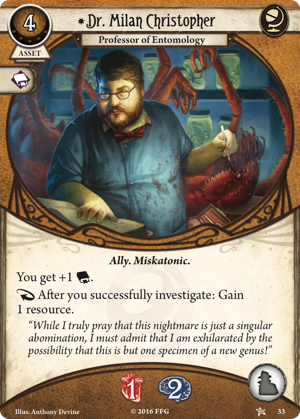 So, you’ve bought your Core Set of Arkham Horror: The Card Game, cracked it open, assembled a couple of the starter decks and taken your first forays into battling the mythos. You’ve scratched the surface and find yourself wanting more. You start to think: "Maybe I could change my deck." 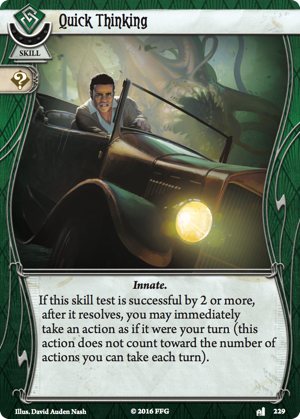 If this seems familiar to you, snap, because that’s exactly how we felt after our initial experiences with Arkham Horror: The Card Game! 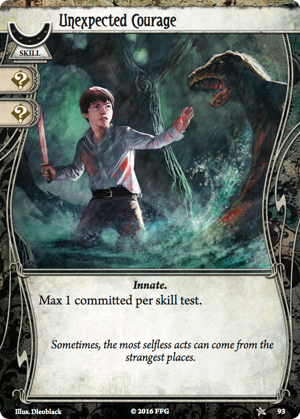 Like any game that includes deckbuilding, Arkham Horror: The Card Game contains its own challenges before you even draw that opening hand or take those first actions. 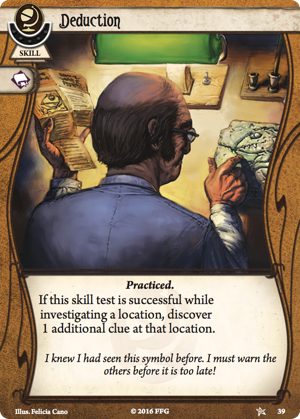 One of the game’s many joys is that every investigator has different deckbuilding requirements and restrictions—although, for a newer player, that might not be a boon as it’s easy to feel overwhelmed with options! 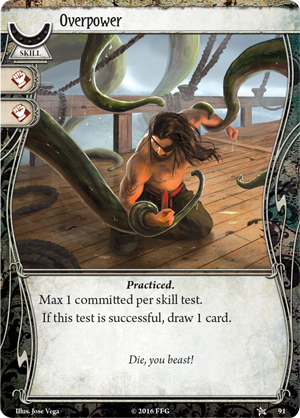 Today, we’ll be stripping deckbuilding down to first principles, highlighting what sort of questions you might want to ask yourself as you build a deck, and providing you with examples as Frank builds his own investigator deck. Depending on your collection, you might not have every card we mention: don’t worry! The important thing to keep in mind is the deck you want to build with the cards you have available. Who knows, you might just come to love the process! Which other investigators will you be playing with (if any)? Most importantly, what do you want your deck to do? Having at least a rough answer to these questions when you start out will stand you in great stead, and it’ll help you settle on an investigator. When in doubt, pick a faction that best matches your answer to that third question; our faction introductions may give you ideas as well! 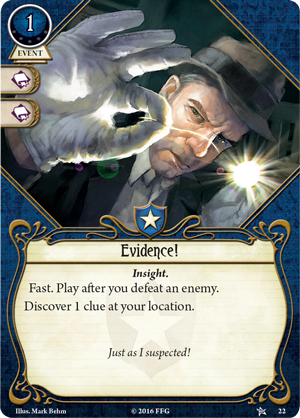 Once you have settled on an investigator, it’s time to hone in on how you want your deck to excel. Even if you don’t know the specific challenges a campaign will throw at you, it’s safe to assume there’ll be a mixture of investigating, dealing with enemies, and covering ground to complete your objectives. If you’re playing solo, you’ll need a scheme for handling a bit of everything. With multiple Investigators, however, you and your colleagues will be able to specialize in a particular area: do you want to be responsible for finding clues, fighting monsters, or ushering the party away from trouble? Again, it depends on your team make-up, but having a sense of the bigger picture can be incredibly useful for clarifying your thinking. On a dark and portentous evening, Frank receives a mysterious letter from his old academic colleague, Peter! 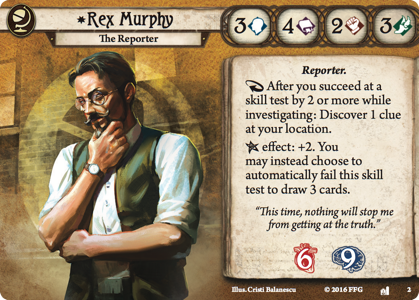 Peter is keen to play through The Dunwich Legacy campaign with his new Rex Murphy (The Dunwich Legacy, 2) deck, and he hopes Frank will join him, for a Standard difficulty campaign. Peter’s Rex deck has a combination of investigating tools and some added tricks to escape from enemies. 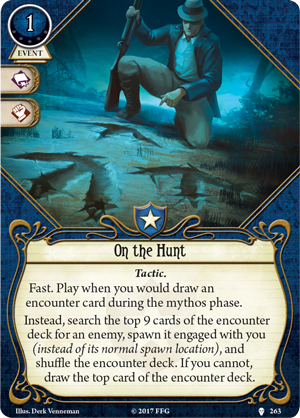 Since it’ll be only the two of them playing and The Dunwich Legacy is going to offer a balanced challenge, they’ll want to have solid capabilities for fighting, evading, and finding clues across their team. 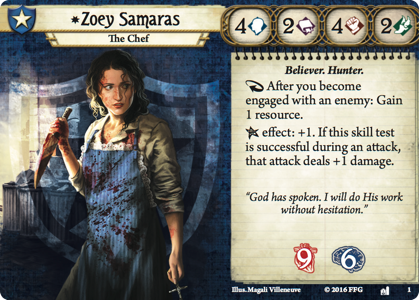 Frank decides to go for a Zoey Samaras (The Dunwich Legacy, 1) deck that’s offensively focused, can protect them both, and also has a few cunning ways to find clues. 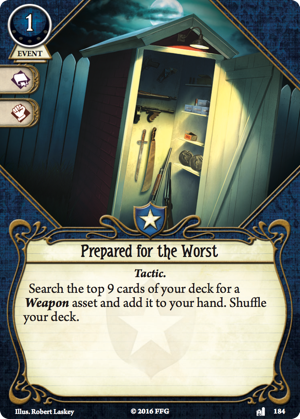 With an investigator and a focus sorted, it’s time to start building your deck! Your aim with these early choices is synergy, so that every card you draw during the game pulls you in the same direction. A deck needs to work as a whole, rather than as disconnected elements. 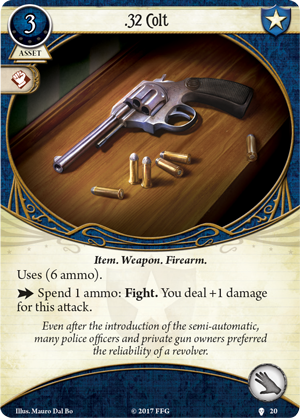 As a priority, grab cards to enhance your core proficiency—such as a .32 Colt (The Path to Carcosa, 20) to deal more damage if you have high Combat, Deduction (Core Set, 39) to enhance how many clues you can swipe, or Peter Sylvestre (The Dunwich Legacy, 33) to boost your evasive abilities. If a card is central to your deck’s purpose, you want to maximise your chance of drawing it; consider adding two of most cards to your deck! The other essential element to consider while building your deck is its economy. 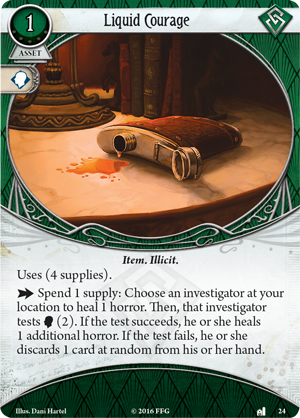 Investigators typically start the game with five cards and five resources and gain one of each during the Upkeep Phase, but this probably won’t be sustain your deck throughout the entire scenario. 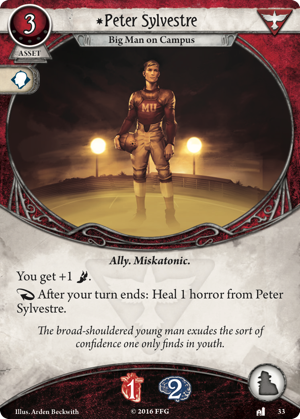 There are handy neutral cards like Emergency Cache (Blood on the Altar, 194) that can offer you a boost, and every faction also has its own ways of generating cards and resources. 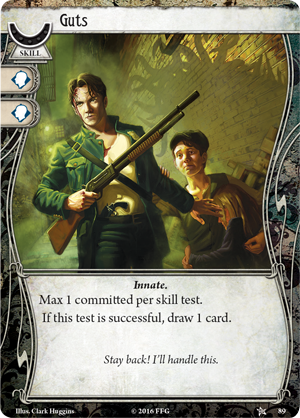 For example, maybe you’re a Roguish Lone Wolf (Blood on the Altar, 188), or perhaps you’re a Seeker whose investigations are rewarded by Dr. Milan Christopher (Core Set, 33). The fewer actions you spend refilling your hand or stockpiling resources, the more actions you have for fighting against the mythos or progressing the act! As a rule of thumb, consider (roughly) how many resources you’d need to play the crucial assets and events in your deck over a typical scenario, how many cards you’d like to see to draw those core elements, and check whether your economy can keep up with your estimation. To begin, it’s usually better to err on the side of too many resources rather than too few. 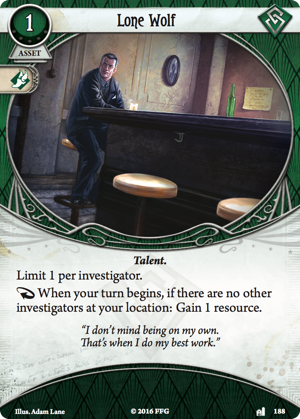 Keep track of how your decks perform when you play, and you’ll soon be able to judge what’s right for your investigator. Frank knows Rex will have investigation on lock, so he keeps his deck focused on combat. 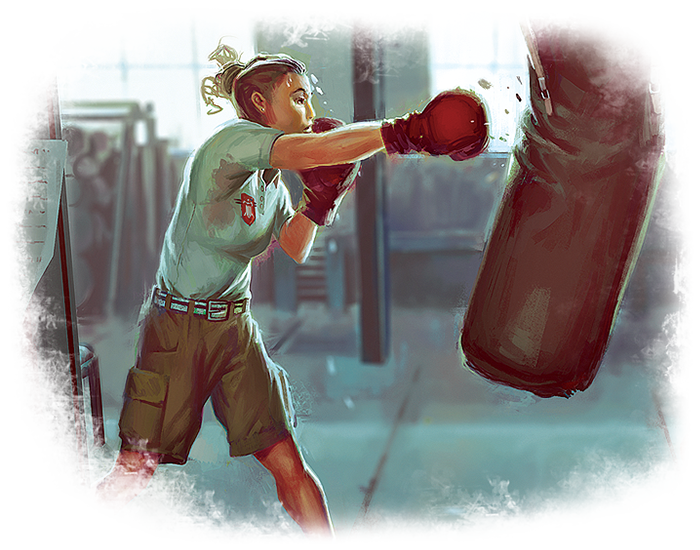 First in are cards that allow Zoey to fight more efficiently and protect her ally from damage. 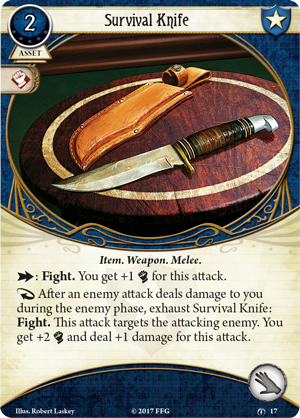 Weapons are high on the priority list, so Frank grabs two copies each of Machete (Core Set, 20) and Survival Knife (The Forgotten Age, 17). 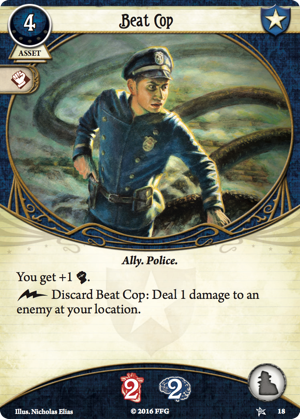 Beat Cop (Core Set, 18) boosts Combat, which Frank aims to be using most turns, and provides Zoey some extra health and sanity. Lastly, Dodge (Core Set, 23) rounds out protection for those hits Zoey can’t ward off Rex. 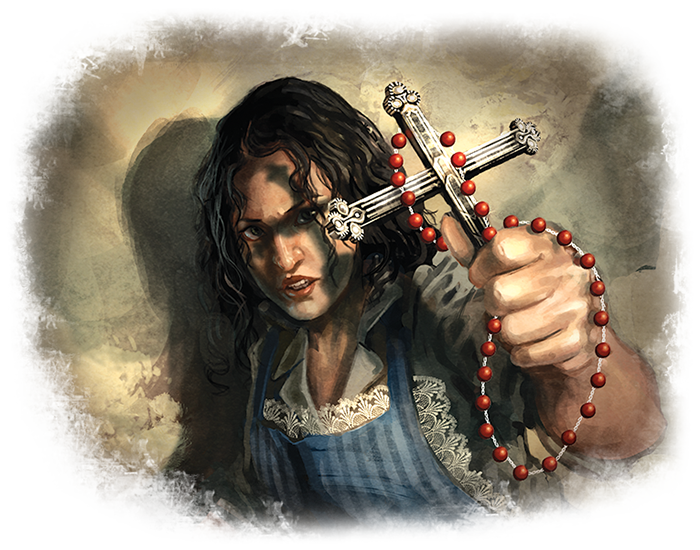 Then there’s Prepared for the Worst (Blood on the Altar, 184), the closest thing to a card-draw card in the Guardian faction at zero experience. 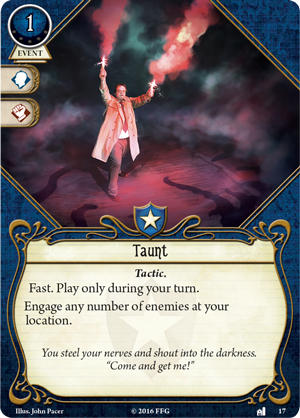 Zoey’s reaction gains her resources for engaging enemies, so Frank adds in Taunt (The Dunwich Legacy, 17). 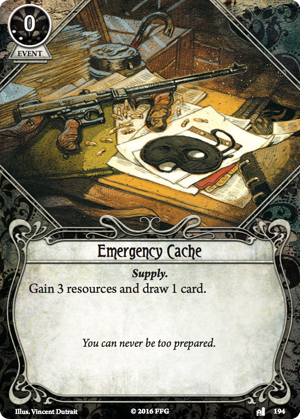 That ability can go a long way towards boosting resources but as Guardian cards are often be expensive, he adds two copies of Emergency Cache just in case. While he’s thinking about resources, he picks two copies of Physical Training (Core Set, 17). It boosts the skills Zoey wants to be using, and if she’s ever rolling in resources, it’ll come in handy. With the core idea and essentials covered, you should be about twelve to sixteen cards into your deck. Now it’s time to shore up weaknesses and add some personality to the deck! In an ideal world, every deck could stick to its single central principle and not have to worry about anything else. 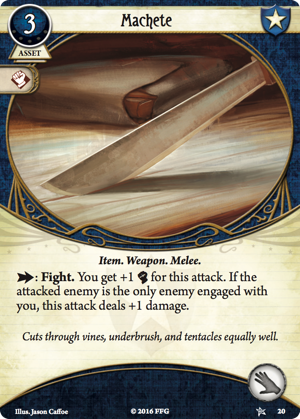 But this is Arkham Horror: The Card Game, so some tools to tackle unforeseen challenges are paramount. 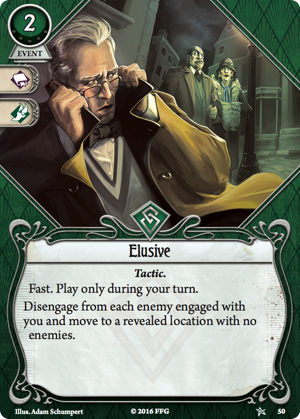 Again, the fact that the game is about individuals, rather than monolithic factions, really adds flavor, and it means a card that could be discounted by one investigator shines in another’s deck. It’s your deck after all, so it should definitely be informed by your preferences and experiences. 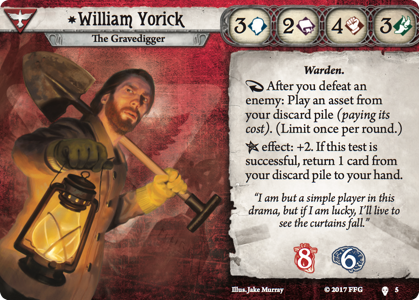 For the investigators found in The Dunwich Legacy, the five out-of-faction cards they’re allowed as part of their decks are a great way to show off some style or indulge in unexpected synergies. With only five, it’s not always wise to rely on them as cornerstones of a grand strategy, but there’s so much scope to add a fun, unusual, or powerful card from another faction! 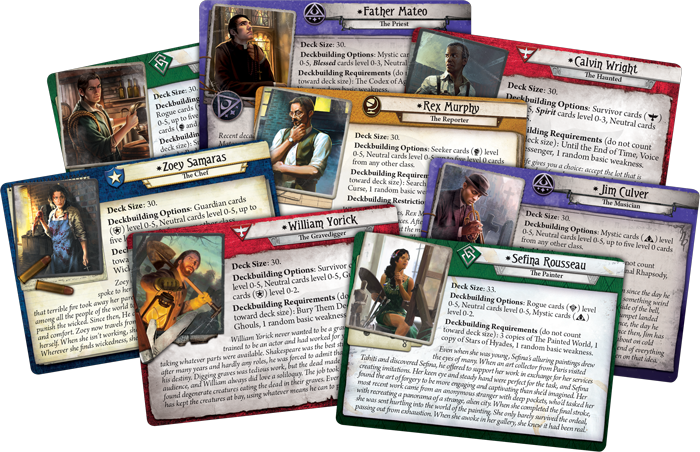 For other investigators, it’s worth looking once more at what, if anything, is offered by an "off-class" faction—those cards might provide a welcome twist or offset the vulnerabilities of your main class. While Frank thinks Zoey’s Willpower of four means she can reasonably include some spells, he realizes two copies of Quick Thinking (Undimensioned and Unseen, 229) for extra attacks on turns where they’re swamped could be life saving; he might even get to attack during the Mythos Phase! Elusive (Core Set, 50) lets him cover ground extremely quickly, so two copies go in. Frank then looks at a worrisome weak spot for Zoey, her low sanity, so he picks a single Liquid Courage (The Dunwich Legacy, 24) to round out the choices. A mobile, heavy-drinking Zoey. Perfect! Lastly, you’ll probably find you have a host of cards you want to include, far more than the thirty-card deck limit. After the festival of letting your imagination run riot as you grab all sorts of cards, take some time to consider the balance in your deck as a whole. A good starting point is 12/10/8 (assets/events/skills), so that you have cards that provide long-term boosts (assets), options for tricky situations (events) and strong cards to commit (skills). 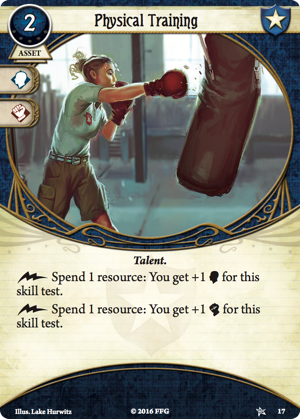 Like so much in deckbuilding, that division isn’t a hard-and-fast rule, and some investigators might find themselves favoring more radical splits: event-heavy decks often can’t afford to set up too many assets, while skill-heavy decks usually have plenty of resources to spare. For your first few decks, however, this ratio is a great place to start! With some hard choices made, Frank works through the cards in front of him, trying to look for a roughly even split of icons and card types. 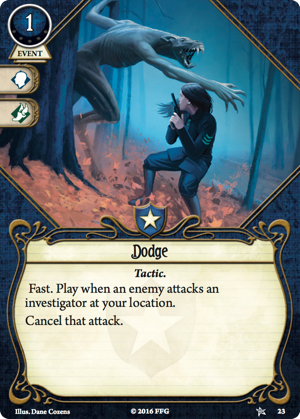 With the core of his deck mostly assets, he pays particular attention to events, adding in Evidence (Core Set, 22) and On the Hunt (Black Stars Rise, 263) for when he’s ready to fight. 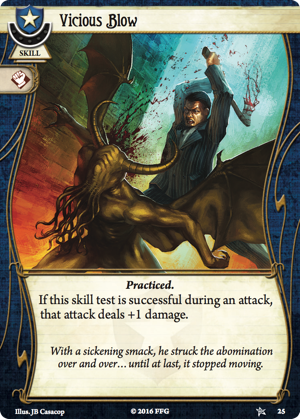 He also adds some skills: in go Unexpected Courage (Core Set, 93), which is a great all-rounder, Vicious Blow (Core Set, 25) for more damage and extra neutral skill cards to give him a range of icons to commit to tests— Overpower (Core Set, 91) and Guts (Core Set, 89). As you gain more experience with the game, you’ll find new ways of building decks. It might be something as simple as finding a trio of fun cards you enjoy playing and deciding to get them all into a deck together. 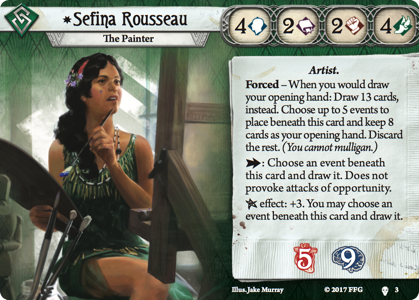 Maybe you want to explore a particular theme or the more curious investigators, such as Sefina Rousseau (The Path to Carcosa, 3), with her focus on events, and William Yorick (The Path to Carcosa, 5), who can dig up assets from his discard pile. Both encourage you to reconsider the deckbuilding process through a new lens. The best way to improve at deckbuilding is playing with a deck, so you can get a feel for its cost curve and those cards that shine, or that aren’t pulling their weight. With experience, the decisions you make in deckbuilding will come more easily; as your investigations progress and you find your place in the team, there’s plenty more you’ll learn. The eyes of Arkham look to you in search of a hero. With these strategies in your arsenal, you are ready to start your investigations and defend the city from the terrifying forces of the mythos. So, grab your Bulletproof Vest, partner up with your Beat Cop buddy, and don’t forget to keep up with your Arcane Studies—the adventure is about to begin! 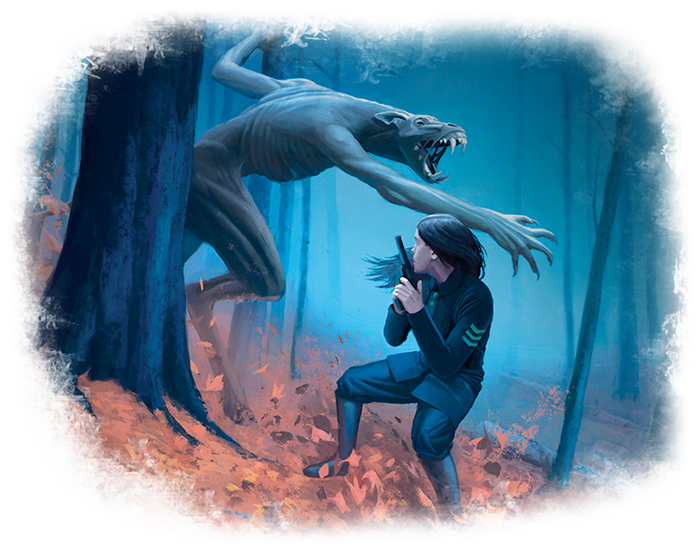 To jump into the Mythos, you can pick up your copy of Arkham Horror: The Card Game(AHC01) at your local retailer or on the Fantasy Flight Games website here!